A66 is a potent and specific p110α inhibitor with IC50 of 32 nM in a cell-free assay, >100 fold selectivity for p110α over other class-I PI3K isoforms. (C) Western blot analyses of pAkt in MMTV-MT tumor derived cells treated with various PI3K inhibitors (in micromolar) as indicated following growth factor starvation. (D) Western blot analyses of pAkt in MMTV-NeuT tumor-derived cells treated with various PI3K inhibitors (in micromolar) as indicated. (*) P < 0.01; (**) P < 0.001 (Student’s t-test). Genes Dev, 2012, 26: 1573–1586. A66 purchased from Selleck. (A) Tumor volumes of MMTV-MT tumor transplants treated with various PI3K inhibitors as indicated (n = 12 per group). (B) Tumor volumes of MMTV-NeuT tumor transplants treated with PI3K inhibitors as indicated (control, n = 20; GDC-0941, n = 20; A66, n = 16; and TGX221, n = 16). (*) P < 0.01; (***) P < 0.0001 (Student’s t-test). Effect of ICOS and PI3-kinases on early signals, IL-17A, and IL-21 secretion by Tfh cells. CD4+ T cells were cultured for 4 days under Tfh-differentiation conditions. Then, (a) Tfh cells were activated for 20 min with anti-CD3 antibodies in the presence or absence of anti-ICOS antibodies, and phosphorylation of Akt (pSer473Akt (top); pThr308Akt (middle)), or Erk (pErk, bottom) was determined in cell lysates by immunoblot. Anti-Akt or anti-Erk antibodies were used for loading controls, as shown in the figure. 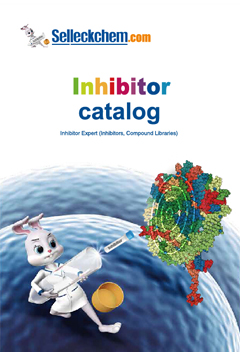 Where indicated, 1 μM PI3K inhibitors (p110α/p110δ, ETP-46321 (α/δ); p110α, A66 (α); p110δ, IC87114 (δ)) were added. The relative O.D. in each lane is plotted in the right panels. *Significant differences with samples in lane 3 (p < 0.05, Student's t-test). Biochem Pharmacol, 2016, 106:56-69. A66 purchased from Selleck. 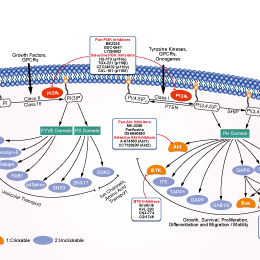 The selective PI3K p110α inhibitor suppressed GBC progression both in the WT and E545K cells in vitro. a-d After treated with (A66) or without (CON) 15 μM/L A66 for the GBC-SD cells and 5 μM/L A66 for the NOZ cells, Cell proliferation of WT or E545K GBC-SD and NOZ cells was evaluated using CCK8 cell viability assays. Cell proliferation was represented as cell quantity. Data are presented as mean ± SD (n = 5). J Exp Clin Cancer Res, 2016, 35(1):97. A66 purchased from Selleck. Mol Cell Biochem, 2018, 439(1-2):199-211. A66 purchased from Selleck. After starved in serum-free medium for 24h,A549 cells incubated with the indicated concentrations of A66 for 3h,followed by 20-minute stimolation of 100ng/ml EGF. Dr. Zhang of Tianjin Medical University. A66 purchased from Selleck. Highly selective for the p110α isoform. Jamieson S, et al. Biochem J, 2011, 438(1), 53-62. Sun M, et al. Proc Natl Acad Sci U S A, 2010, 107(35), 15547-15552. Smith GC, et al. Biochem J, 2012, 442(1), 161-169.